Home Science for Kids 5 Ws & H How are Earthquakes Recorded? 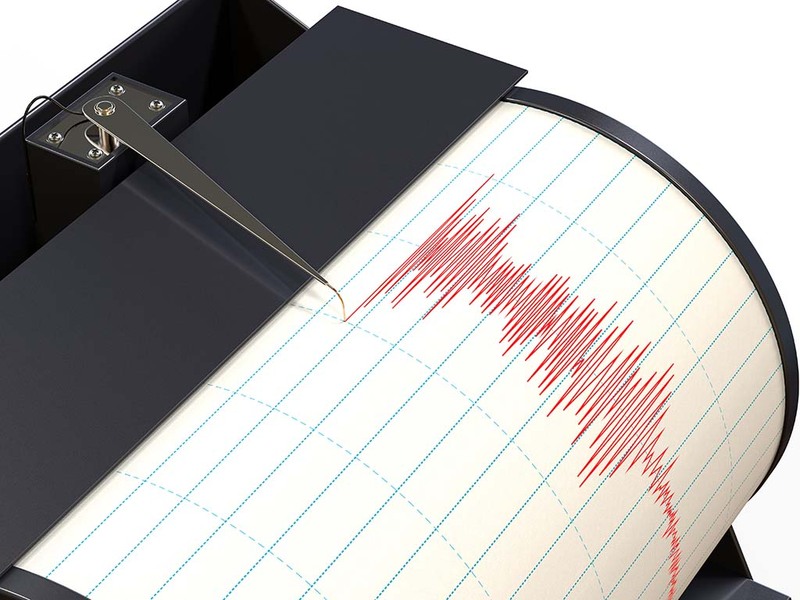 When an earthquake takes place, people say that it measured 6.2 or 6.5 on the scale. The scale they are referring to is the Richter Scale developed by Charles Richter in the 1930s. The Richter Scale measures the magnitude of the seismic waves or vibrations that travels across the earth’s surface. The scale uses a logarithmic formula using high-frequency data collected from seismograph stations. However, long before Richter developed his scale, a Chinese philosopher Chang Heng invented a device to measure earthquakes in 132 A.D. He constructed a large urn that had eight open-mouthed dragon-heads holding a ball each in their mouths, on the outside. Each head faced one of eight principal directions of the compass. Below each dragon-head was a toad with its mouth open. When an earthquake did occur, one or more of the eight dragon-mouths would release the ball into the open mouth of the toad below. Depending on which dragon released the ball, the direction of the earthquake was identified. After an earth-shattering rumble, one of the first question people ask is “where was it?” Unfortunately, the earth is not transparent and we can’t just see or photograph the earthquake disturbance. When an earthquake occurs, it generates an expanding wave front from the hypocentre (The calculated location of the focus of an earthquake) at a speed of several kilometres per second. Scientists have for centuries tried to device a method to study the force of these seismic waves. Before the advent of electronic instruments, scientists built large spring-pendulums to record the vibrations produced by quakes. It was only in the late 19th century that a 10-point scale was conceived by François-Alphones Forel and Michele Stefano de Rossi. In 1902, Italian volcanologist Giuseppe Mercalli created a 12-point scale of intensity. Mercalli’s scale measured the intensity of shaking during an earthquake. This is calculated by inspecting the damage caused by the quake and interviewing the survivors later. However, this was not very accurate as the intensity of shaking varies from place to place and different ratings were given for the same earthquake. Unlike the Mercalli scale, the Richter scale measured the magnitude of an earthquake at its epicentre (a point on the earth’s surface directly above the hypocentre of an earthquake). This was more accurate as there can be only one measure taken no matter where you record it. Magnitude is calculated according to the amount of energy released during the earthquake. Earthquakes are recorded by a whole network of seismographic stations located at strategic places across the world. A seismograph is a simple instrument that consists of a suspended weight with a pen attached to it. Next to the pen is a large paper roll. Under normal conditions the pen draws a straight line. As the ground vibrates due to the tension released from below the surface of the earth, energy is released and travels outward in waves. When the frame vibrates, the pen draws a zigzag pattern. This line is called a seismogram and records the amplitude of the seismic waves at the site. The ground motion at each seismograph is recorded electronically at the recording site. As the wave expands from the earthquake, it reaches more distant seismic stations. Each station measures and times the distance and time the wave front passes the station and this is then tabulated until the epicentre is located. With new technology, it became apparent that the Richter Scale was valid only for certain energy frequency and distance ranges. So scientists have developed new magnitude scales that are an extension of Richter’s original idea. These include body-wave magnitude, surface-wave magnitude, and moment magnitude. For very large earthquakes, moment magnitude gives the most reliable estimate of earthquake size. Sometimes the magnitude is reported by different networks based on only their recordings. This difference is a result of the different instruments used and their locations with respect to the earthquake epicentre.